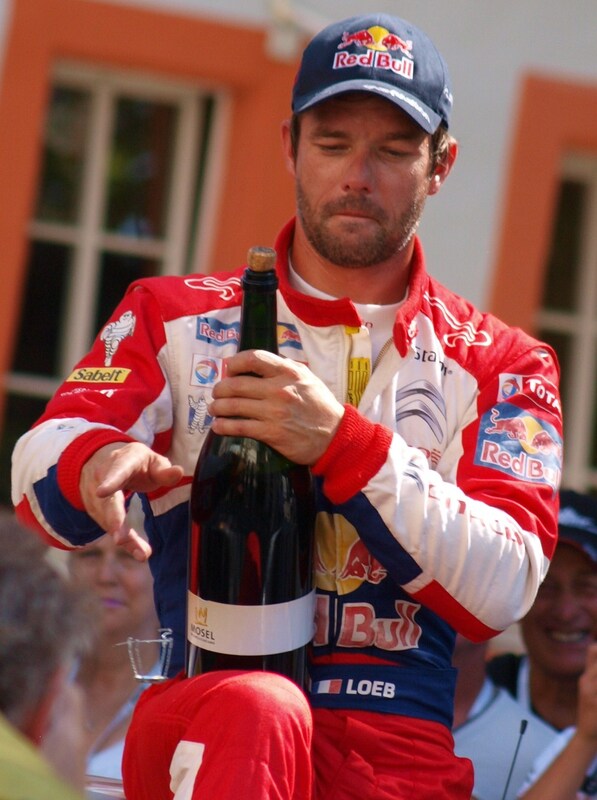 Sebastien Loeb won his last WRC rally as a championship competitor in Spain last weekend. The 9 times champion, finishing the 2012 season on a high. It was a tough event with many drivers on Day 1 suffering from condtions and struggling to stay on the road. 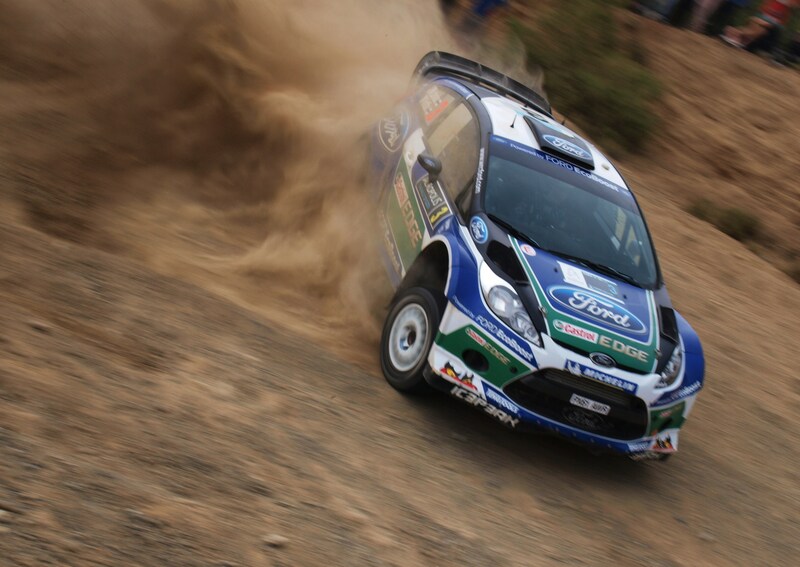 After the first 4km stage on Friday, Fords Jari-Matti Latvala had the lead. On the following stage many of the front runners went off in tricky, wet and muddy conditions, the likes of Petter Solberg, Neuville and Mikklesen or off in the same place after hitting a rock in a dip, and damaging the car. It was young M-Sport driver Ott Tanak who then held the lead as more top names fell off the road and into retirement. But after an impressive and storming performance in undriveble conditions, it was Norweigen Privateer Mads Ostberg that held the lead by the end of day 1. After the tough conditions on the Gravel stages of Day 1, it was now on to the Tarmac of day 2. The teams and their mechanics had a 45minute ‘Flexi-service’ to change the set-up, brakes, suspension and gear box to Tarmac spec. The cars now lower, stiffer and ready for racing on the race circuit like Spanish mountain roads. Loeb may not have been comfortable enough to push on day 1, but he was picking up his rhythm enough to put pressure on Ostberg. Ostberg may have been the driver of the rally on day 1, but day 2 was all about Latvala and Loeb. On the first stage latvala was quick out the box in attempt to try and make up time on loeb. On the 2nd stage of the Day, Mads made a mistake and went off the road, and dropped nearly 40 seconds and lost the lead, the Norwegian wasnt happy on the black stuff and made several more mistakes in the day. 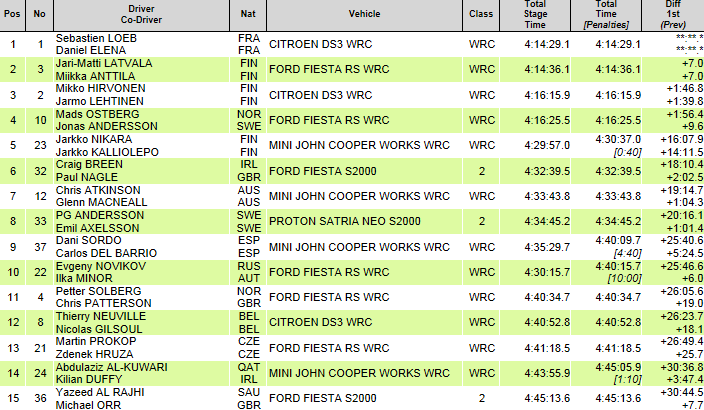 Loeb was now in front and Ostberg was down in 3rd with 4th place Hirvonen closing in on him. Once Loeb was in front and could smell the victory, he upped his pace and opened up the gap. The 9 times champion ended the day with a 27 second lead over Latvala. Day 3, the final day of Rally Spain. Jari-Matti Latvala set out to do what he could to catch Loeb. On the first stage of the morning though, it was Mini’s Dani sordo who was lighting up the timing screens on his home event he wanted to prove that, despite retiring on day 1 he still had the pace to match the top boys.The Spaniard went on to be fastest on all 3 of the mornings stages. In the afternoon loop, Latvala managed to pick up his pace more and continued to take time out of the world champion at the top. 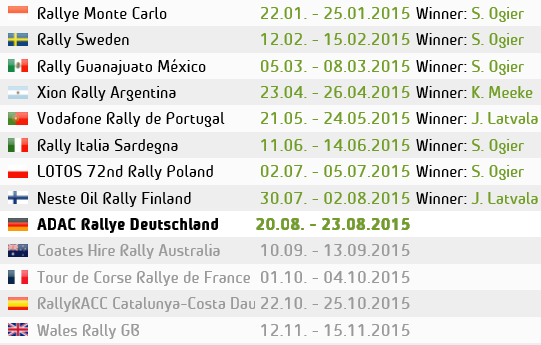 Also going fastest on the penultimate stage of the rally, used as the power stage to claim 3 bonus points. Latvala had closed up to within 9.1 seconds of the leader with just a 4km final stage to go. Latvala pushed hard, and in them 4km managed to take out 2.1 seconds out of the leader. But unfortunately ran out of milage to catch him.